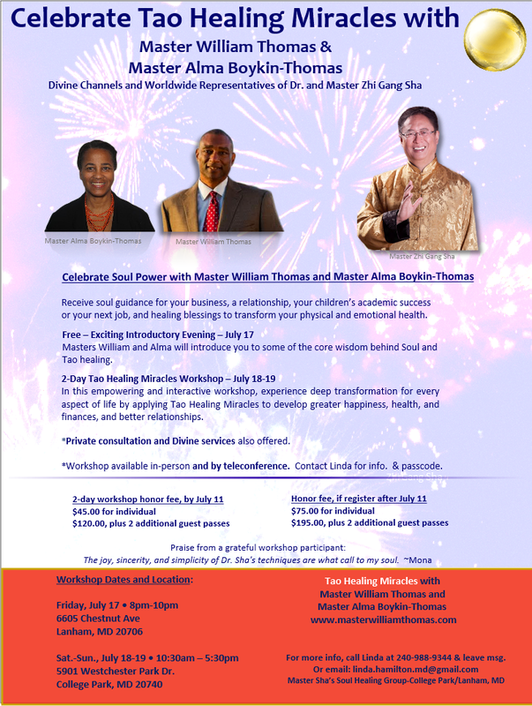 July 17, 18, 19 Tao Healing Miracles workshop in the DC area with Master William Thomas and Alma Boykin-Thomas! We are using Paypal for the workshop honor fee (payment). A Paypal account is not necessary to make a payment through Paypal. (See instructions below). Credit, debit and cash also accepted at the door or by contacting Linda. Please honor for the workshop service by selecting the payment amount from drop down box, and click on Add to Cart (see below). Note: You do not have to have a PayPal account to use PayPal. - Click on Add to Cart. Press Check Out button. - At bottom right of the PayPal page is a link to Pay with a debit or credit card, or PayPal credit. This is a wonderful opportunity to be with advanced spiritual teachers and healers. Learn how to become a Divine Healing Hands healer. Please call Linda at 240-988-9344 or email linda.hamilton.md@gmail.com for more information on the free Friday evening introduction to the workshop or the weekend workshop.